Seafood takes on a whole new meaning in Sharktopus. The SyFy Channel’s latest genetic hybrid creature feature is 50% shark, 50% octopus and 100% delicious cheese. 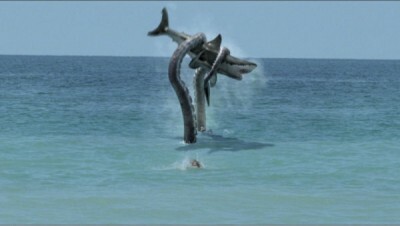 It took far more gall than imagination to produce a movie like Sharktopus, one of the latest SyFy Channel originals about a couple of nasty creatures who are genetically combined to form one really nasty creature. Stop me if you’ve heard this one: The aforementioned government-sponsored genetic experiment gone wrong — this one melding a shark and an octopus — escapes its captivity and wreaks havoc on the beaches of Puerta Vallarta while an attractive and witty young crew tries to catch the monstrous hybrid before it kills again. Yes, it’s exactly what you think it is, but with even more needlessly hot bikini girls and merciless evisceration than even I expected. The graphics and design for the beast itself will not be confused with something out of Peter Jackson’s WETA Workshop. But considering the below-the-radar nature of this Syfy creature feature, the thing looks pretty good, with an inventive variety of fangs, claws and surprising abilities at its disposal. The sharktopus’ random acts of brutality would be repetitive except that the movie consistently ups the ante until the beast is smashing large boats and using its tentacles in a way that is rarely seen outside of Japanese cartoons. The DVD’s sole bonus feature is a commentary track by producers Roger and Julie Corman (Dinocroc vs. Supergator) that finds the couple having some fun as they describe making the monster flick, something ol’ Roger has had a lot of experience doing.